"They sent a chopper after me," is how my first few text messages to friends and family went. It was an epic race with a hell of a story for an ending...but more on that later. 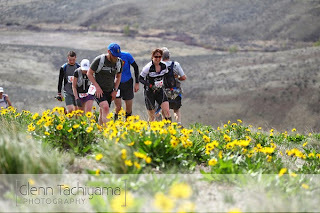 The forecast for this past weekend for the Volcanic 50 showed highs climbing into the 90's at 2k to 3k feet of elevation. Higher up it would be cooler but only slightly. Add to the mix a course with very little shelter or shade, 20mph dry hot winds, switchbacks up exposed pumice/sand canyons...and well what we had was a recipe for 'epic' and a fair amount of DNFs. 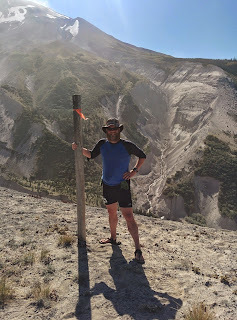 The Volcanic 50 website said something about this 50k running more like a 50mi. I'd say it ran like a 50k around a volcano plopped in the middle of the Sahara desert. Modest elevation gain and loss was upset by the frequent technical trails and/or lava fields. So when my buddy Chris high-fived me at mile 29 for a race well run, little did I know that last 2.5 miles would be my undoing. In the finish area after the race I found myself grateful that my 'bonk' wasn't nearly as severe or potentially harmful as others that were gathered around the the aid trucks at the finish area. One hard-core older lady next to me was just regaining her hearing after a couple liters of IV fluids had replaced some of her lost bodily fluids. Yes you heard that right...her senses had begun to shut down. Another fellow was a "priority one" evac after his hypertension AND dehydration had him sporting a pulse of 260 and other iffy vitals. Yep I was the lucky one in this group of three even though I was the one they had sent the helicopter for. But first...the course, the race.... was absolutely amazing. I remember early on silently thanking the designers of this race for having it run clockwise around St. Helens. The result was impressive vistas with the sun at our backs for a good portion of the race. Up until approximately mile 29 I had thoroughly enjoyed every part of this course. There were a couple fast well manicured downhills early on followed by a spectacular climb into the 'blast zone' and then a journey across this 10 mile ashy expanse ...it was like a Mars or Moonscape punctuated by silty grey creeks discharging from their source glaciers higher up in the crater. 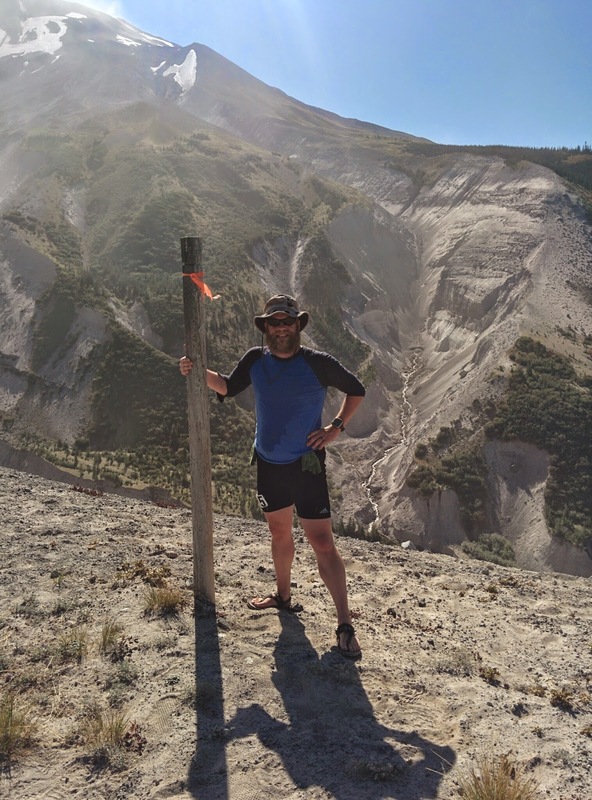 By the time I arrived at aid-station four I thought I was well watered and declined to top-off my hydration pack. That decision would later by my undoing. For those of us lucky enough to catch up with the sun as we rounded back to the scorching south side and the finish, the heat that met us was killer. At times it was like a sucker-punch to the gut and a slap to the face. Black lava, no shade, and a sudden lack of cooling wind turned my dehydration to something slightly more serious. Shortly after mile 29ish where Chris and I gave each other that ill-fated high-five things for me turned ugly quick. Anticipating a quick downhill through shady forest to the finish line I finished off the last of my water thinking I'd just gut it down to the finish. Instead Chris and I rounded a corner and were quickly confronted with one last uphill through a seemingly vast lava field with rocks sometimes the size of a small car. Crap. My pulse had already been racing anytime I hit sun so it only took about 5 minutes more of direct sun before I found myself increasingly unable to control my heart-beat and had begun to lose my ability to regulate my body's core temperature. I'd felt these symptoms before when I'd once had heat exhaustion, collapsed and hyper-ventilated on Mt. Rainier several years ago. I got a little scared. I knew I was in trouble. About half way through this last field I stopped to take in some shade, no longer able to get my heartbeat down even after minutes of rest. A few steps later and another small drainage in said lava field and my balance started to go. My sandal slipped on some razor sharp lava rock and the sheer effort of keeping myself upright took all the remaining strength I had left. So I staggered a few more paces to hide behind a rock just big enough to block the sun. There I turned into a puddle of flesh interwoven round lava chunks both big and small while my legs twitched with sudden cramps. I tried to blow chunks at this point and went into a profuse sweat at the effort. Minutes before my first collapse on the lava field I had passed a racer hunched over having troubles of his own. I really had no knowledge that this fellow would be one of the three men that got me off the mountain. And the amazing thing about him is that he had himself passed out on the lava field mere yards behind me (at about the time I'd passed him). But then he came to, ran up the trail and came upon me laying in the rocks struggling for shade and rest. Here he stopped his forward progress and started feeding me a banana he'd carried for the entire first 30 miles of the race. And then he went and sacrificed his remaining hydration fluids to me before two of his friends sent him down to the finish line, himself bone-dry. I would meet and thank him later. Then these two new friends of mine fed me more of their supplies and treated me to Miley Ray's "Wrecking Ball" played from one fella's "sound amplifying case" for his Galaxy smartphone. That music and the kindness of these three strangers revived me. It took a half hour of rest and drinking to bring myself to stagger to the end of the lava field and the beginning of trail and shade. My two new friends would run behind both my shoulders the remaining 3 miles to ensure I didn't fall. At about a mile from the finish I heard the chop chop of helicopter blades and wondered if that chopper had been sent for me. A mile later I found out it had been sent for me. Several racers had reported a sandal-wearing bearded man seemingly passed out in the rocks three miles from the finish. While I was in fact not passed out, I'm sure I looked the part. And this is why I run ultras. The people that run them, are in general amazing and honorable human beings. We look out for each other on the trail, share water when needed, and encourage each other on. These men helped me finish and more importantly survive without injury and for that I find myself very grateful. 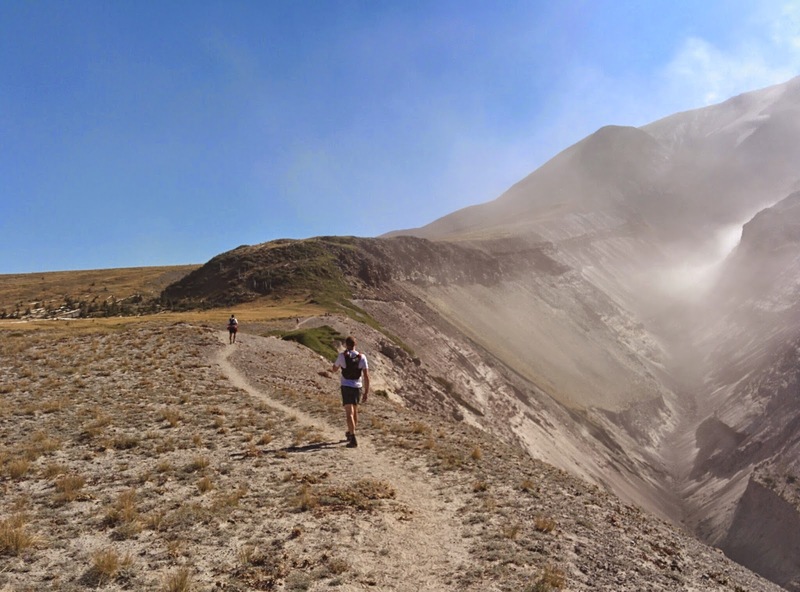 As a added bonus the Loowit trail around St. Helens was breathtakingly gorgeous for the entirety of the course. All of the volunteers and race organizers for putting on this logistical nightmare. To the Department of Homeland Security: turns out they bought trucks and supplies for local EMS. 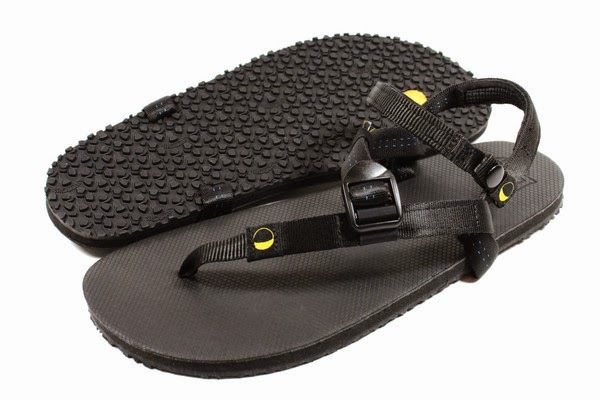 Luna Sandals - 33 miles, no blisters, 4 stream crossings. Thank you Luna for helping make this race so fun.